"For many, the enjoyment of hearing and seeing wildlife is one of the many reasons people own land," said Salvador Salinas, Texas NRCS state conservationist. "For others, it may be the enjoyment of a rural lifestyle where hunting or wildlife photography is important or being able to pass the land onto future generations in better condition than when it was acquired. Whatever the reason, with more than 83 percent of Texas land privately-owned, the landowner is in the driver's seat when it comes to taking action to conserve, enhance and beautify their land for wildlife." The initiative is a result of a partnership effort with various conservation-minded groups. 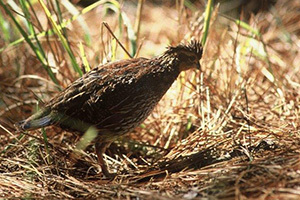 Along with NRCS, partners include the Texas Parks and Wildlife Department (TPWD), Oaks and Prairies Joint Venture's Grassland Restoration Initiative Program (GRIP), University of North Texas Quail Program (UNT Quail), Western Navarro County Bobwhite Quail Restoration Initiative (WNBRI), Caesar Kleberg Wildlife Research Institute (CKWRI) and the Rio Grande Joint Venture (RGJV), and Soil and Water Conservation Districts (SWCDs).